Gravity, magnets, bows and arrows! Become Hedgehood and use the power of gravity and magnets to aim your arrows and capture all the apples you can. 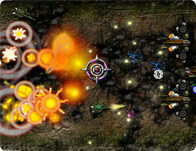 Shoot around corners and avoid obstacles in this challenging arrow based shooter. Mouse: Click on and drag the magnet indicators to guide or repel the arrows.